Spring has sprung here in eastern Pennsylvania – finally! Grass is growing and flowers are blooming. Both Easter and Passover, two of the holiest days of the year for the Christian and Jewish faiths respectively, are taking place in a few days. In America on Good Friday, many Christian families remember the crucifixion and death of Jesus Christ. Then on Easter Sunday, April 21st, they celebrate the resurrection of Jesus by attending church with family and friends. Afterwards, the kids may participate in an Easter egg hunt in the back yard or receive Easter baskets full of goodies to snack on. In Orthodox and Eastern Catholic Churches, eggs are dyed red to represent the blood of Jesus, before being blessed and distributed to congregants. Now they’re mostly just a fun way to celebrate the springtime season, especially with creative decorating ideas. The ornate eggs were called pysankas, which were made by using wax and dyes. It wasn’t until Ukrainian immigrants came to the U.S. that the colorful custom caught on. Later on, families and friends may gather to catch up and share an Easter dinner (with possibly a Jurgielewicz Holiday Duck!). For those of the Jewish faith, the Passover Seder begins on Friday evening, celebrating deliverance from Egyptian slavery thousands of years ago. 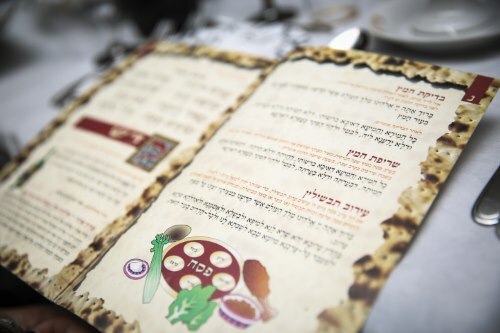 Each of the six elements of the Seder meal has significance, from the bitter herbs of slavery to the spring parsley and the sacrificial lamb shank. Passover is one of the holiest weeks in the Jewish calendar and ends on April 27th. For Catholic Christians, on Good Friday the Pope commemorates the Via Crucis (Way of the Cross) at the Colosseum: A huge cross with burning torches illuminates the sky as the 14 Stations of the Cross are described in several languages. Mass is celebrated on the evening of Holy Saturday, and on Easter Sunday, thousands of visitors congregate in St. Peter’s Square to await the Pope’s blessing from the church’s balcony, known as “Urbi et Orbi” (“To the City and to the World”). Other customs around the world include a Polish Easter tradition called Śmigus-dyngus. On Easter Monday, boys try to drench other people with buckets of water, squirt guns or anything they can get their hands on. Legend says girls who get soaked will marry within the year. The refreshing tradition has its origins in the baptism of Polish Prince Mieszko on Easter Monday in 966 AD. We wish you and your family a blessed time of celebrating the arrival of spring and new beginnings!